As you have probably noticed, I am a big fan of reading readiness. I love when children are ready to read because once they are ready to read, they can start our learn to read free program, and once they start our learn to read free program, children get to experience the magic of reading! Reading teaches you new things and takes you on adventures and instructs you how to do things. 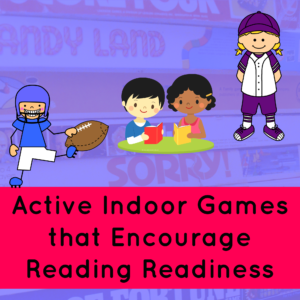 Today I wanted to show you a few fun, active reading readiness games you can play with your little ones indoors so that you can get your child ready to read. The first game we played involved no prep at all. My children love to run in circles around the house. Our home has a natural “circle” around the living room/kitchen area. They enjoy chasing each other around this circle. I let them do this because it does tire them out when they are cooped up inside. I call out a letter, and an action and all the children follow the leader. If I say Letter A! Skip! All the little ones skip while saying A! Ahh! A! Ahh! This activity is too easy for my 9 and 7 year old, but they are not the ones getting ready to read! They love to lead, though, and the younger ones love to follow, repeat and learn. You can do this with all the letters of the alphabet, if you wish. Then, you can start on word families! Have your children call out rhyming words: Call! Ball! Tall! Fall. Even if the words are nonsense words, it is great to have your child learn to rhyme and hear sounds. Next, the children played hop scotch, saying the letters or their sounds. Sometimes I had the students just pick up the vowels, other times I had them pick up the consonants. My older children wanted to make the game more challenging and so they would say the letter, the sound, and a word. A, apple, Ah! 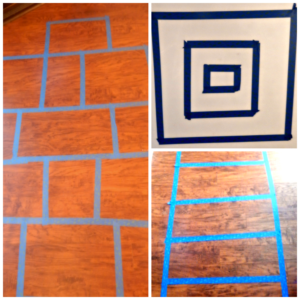 For the ladder that we made on the floor, we jumped from square to square spelling words. My older two worked on their spelling list. My two year old worked on spelling his first name and my five year old worked on spelling his last name. I would have them all shout the letters together. By chorally yelling together, the children have more fun and learn from each other. 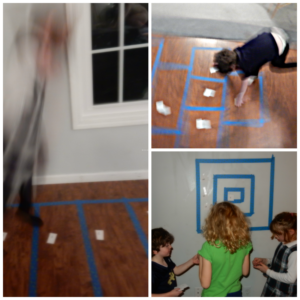 Need another active indoor game idea? Here are a few great ones! So fun! I love reading games that are active and hands-on!